As a food blogger, Thanksgiving is my favorite holiday. And, I’ll bet it’s yours too! 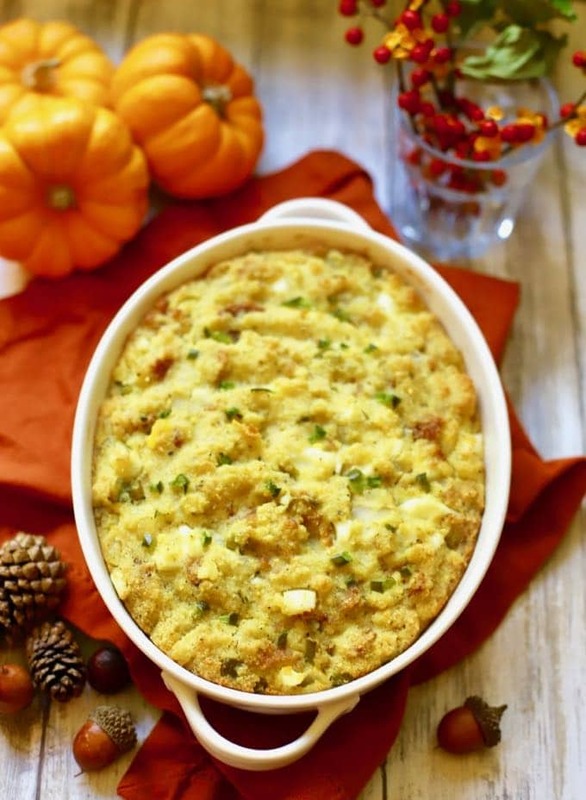 In fact, it is the number one food holiday in America and for a good reason; Traditional Southern Cornbread Dressing aka Traditional Southern Cornbread Stuffing. There is none of the stress related to Christmas with Thanksgiving, just traditions, and good food, and in many cases the same dishes that you ate as a child. Pecan Pie, Sweet Potato Casserole, Turkey, Mashed Potatoes, Green Bean Casserole, you know, the classics! Traditional Southern Cornbread Dressing is one of those classics. When I was growing up, our Mom made Southern Cornbread Dressing with Pecans and Sausage which I dearly love and make every year! 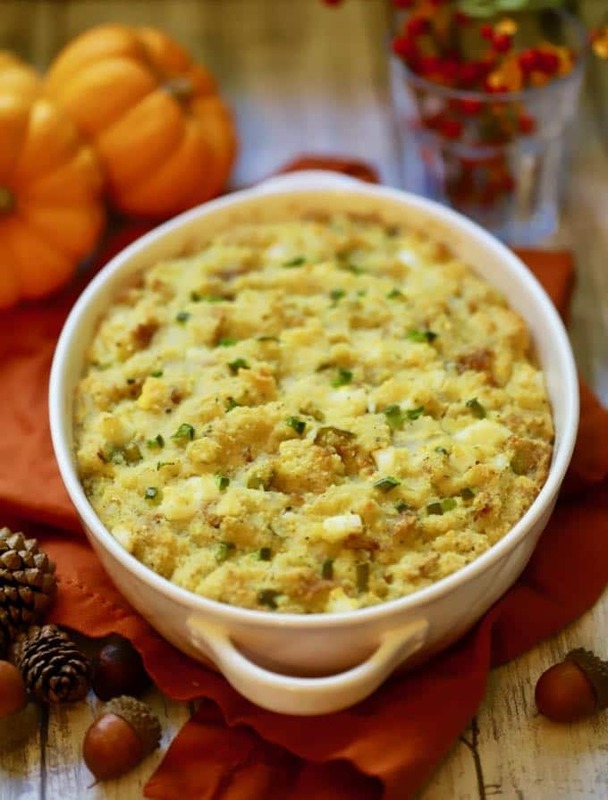 But a friend of ours, Kay Judkins, brought Traditional Southern Cornbread Dressing to our Thanksgiving dinner last year, and once I tasted it I was hooked! She graciously shared her recipe with me and, honestly, I would serve both of these delicious dressings at Thanksgiving if I could and, well you know, I just might this year! In the South, cornbread dressing recipes have been passed down through generations, and there are almost as many variations as there are Thanksgiving turkeys. But the one constant in most of the cornbread dressing recipes is butter! This recipe calls for, hold on to your hat, two full sticks of butter! 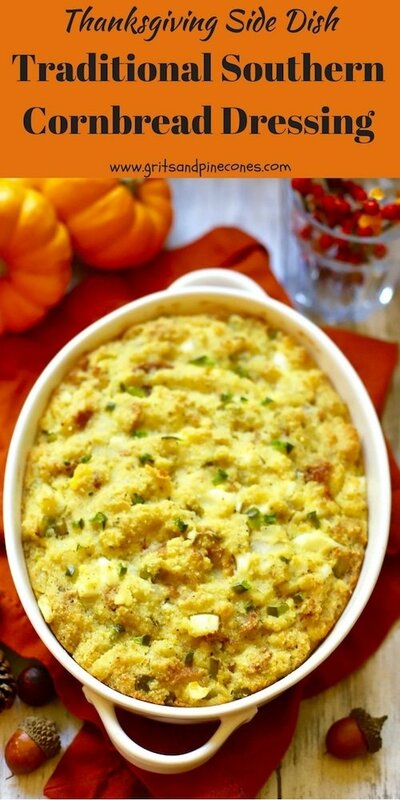 And butter is what makes this cornbread dressing so moist and flavorful! I know what you’re thinking, but it’s only once a year, right? There are so many things to love about Traditional Southern Cornbread Dressing and, in addition to the taste which is divine, the other great things are that it’s really easy to make and both the cornbread and the dressing can be made well ahead of the big day and frozen. If you get in a bind and run out of time to make cornbread for the dressing, around the holidays most grocery stores and bakeries sell pre-made cornbread or corn muffins which you can use instead. Just try to avoid the cornbread with sugar added. 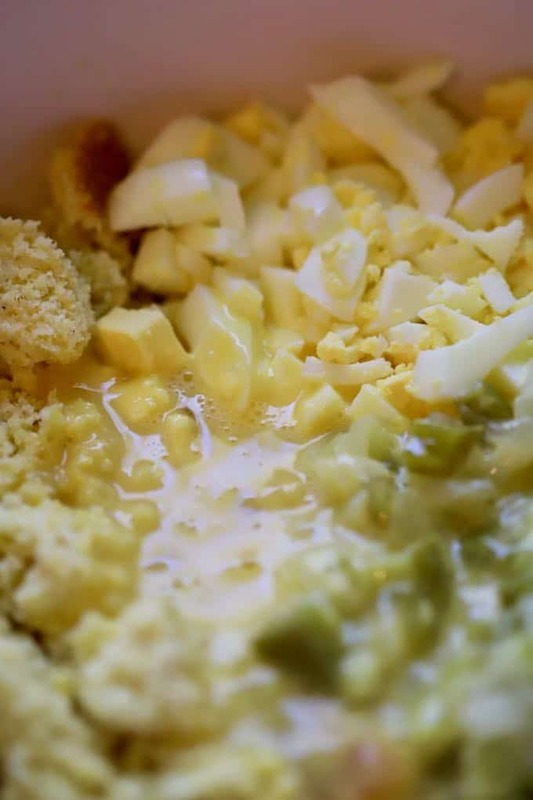 The ingredients for the Traditional Southern Cornbread Dressing include cornbread*, butter, onion, green bell pepper, celery, hard-boiled and raw eggs, poultry seasoning, chicken broth, kosher salt and ground black pepper. Add butter to a large skillet over low heat. 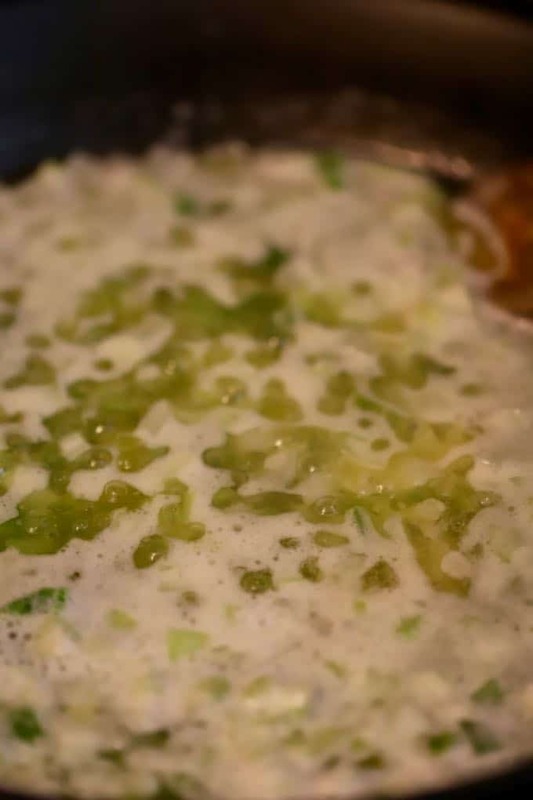 Stir in onions, celery, and green bell pepper. Saute vegetables for 10 minutes or until softened. While the vegetables are cooking, crumble cornbread in a large bowl and add hard-boiled eggs, two cups of chicken broth, and poultry seasoning. Add the vegetables when they are done, and mix well to combine everything. You can use a spoon, but your hands work best for this task. Taste and add kosher salt and ground black pepper. Add beaten eggs and mix well. Don’t be alarmed if the mixture is soupy. If it’s not, add up to one more cup of chicken broth, a little at a time, until it is soupy. It should be about the consistency of thick cornbread batter. Bake uncovered 45 to 50 minutes, or until the dressing is set and golden brown. * My easy Traditional Southern Style Cornbread is perfect for this recipe. Just click on the link for the recipe. **If making ahead, cover and refrigerate the unbaked cornbread dressing for up to two days, or freeze for up to several weeks. Let thaw overnight before baking. 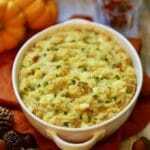 Moist and flavorful, this recipe for easy, make-ahead Traditional Southern Cornbread Dressing aka Southern Cornbread Stuffing is a classic Thanksgiving side dish. Add butter to a large skillet over low heat. 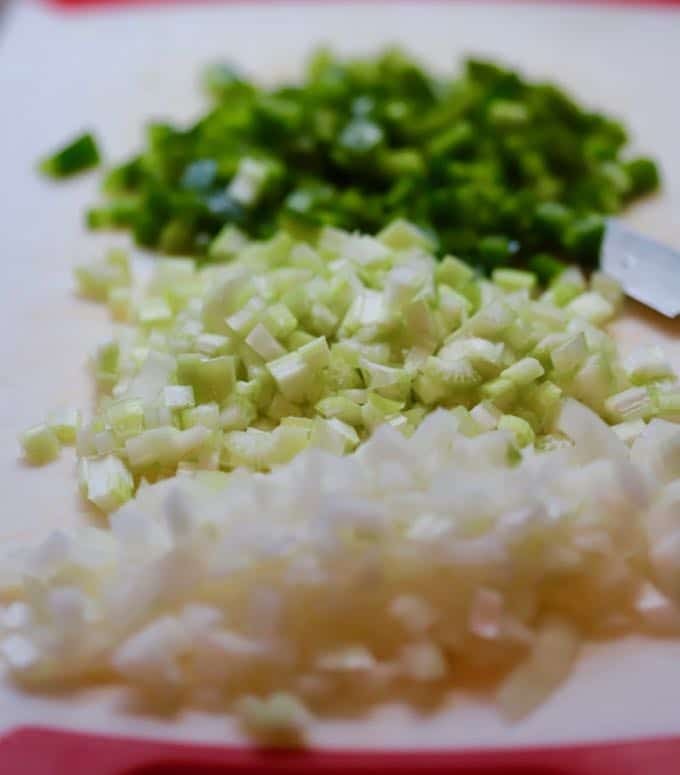 Stir in onions, celery, and green bell pepper; saute vegetables for 10 minutes or until softened. While the vegetables are cooking, crumble cornbread in a large bowl and add hard-boiled eggs, two cups of chicken broth, and poultry seasoning. Add the vegetables when they are done, and mix well to combine everything. You can use a spoon, but your hands work best for this task. Taste and add kosher salt and ground black pepper. Add beaten eggs and mix well. Don't be alarmed if the mixture is soupy. If it's not, add up to one more cup of chicken broth, a little at a time, until it is soupy. It should be about the consistency of thick cornbread batter. * My Traditional Southern Style Cornbread is perfect for this dressing. Just click on the link for the easy recipe. **If making ahead, cover and refrigerate the unbaked cornbread dressing for up to two-days, or freeze for up to several weeks. Let thaw overnight before baking. Just when I thought I couldn’t love stuffing any more… this looks INCREDIBLE! Would be an amazing addition to the Thanksgiving spread- might even steal the show! It looks steal the show!! I looked all over for a recipe for basic cornbread dressing recipe like my Mamaw makes it…no weird stuff that doesn’t need belong in there. I had trouble finding one that called for the right amount of butter. I remembered that it was two full sticks. Well, this isn’t it, and it’s phenomenal! How does she make it? None of this is the way my mother made her dressing !! no bell peppers, celery, yes raw egg, onion, and sage and that’s the WAY she made hers the SOUTH CAROLINA WAY and that’s the way I have always made mine except for the celery!! I always picked it out anyway. things like butter and milk and Kosher salt she would have never used in hers!! plus my dad would have died if he knew all that was in there!! How much salt and pepper do you usually use? Happy Thanksgiving and I hope you enjoy the dressing! So glad you enjoyed it! Thank you for letting me know too! I Keep real chicken or turkey stock on hand because store bought broth does not have a lot of flavor.I have never had cornbread dressing with hard boiled eggs or bell peppers. My mother always added sage to her dressing and so did all of my southern relatives. I will not knock this recipe,because I have’nt tried it. but I cannot imagine cornbread dressing without the sage.